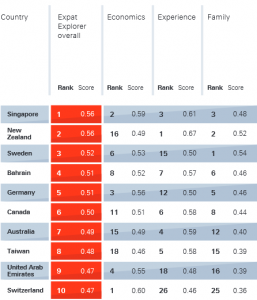 Xpatweb | Where Is The Best Country To Be An Expat? You are here: Home / News / News / Where Is The Best Country To Be An Expat? 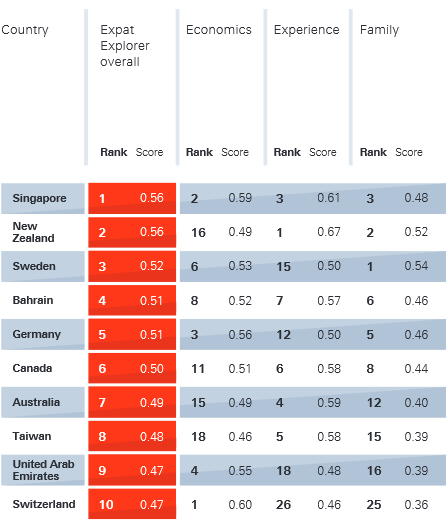 Where Is The Best Country To Be An Expat? A new survey of 21,950 expatriates from around the world has crowned Singapore as the best place to be an expat. The Expat Explorer country league table, commissioned by HSBC and now in its eighth year, uses a variety of criteria including economics, experience and family life. Singapore received a 67% approval from expats living there, who reported being encouraged by the nation’s strong economy and the opportunities available to them for career progression. In the individual pillars, Switzerland ranked first for best economy, New Zealand for experience (overall quality of life) while Sweden was ranked highest for family life. Living abroad has benefits beyond career advancement. Over half of expat spouses said that they felt the experience had brought them closer together. Confusion and difficulty over managing finances in a foreign country was cited as the most challenging aspect of living abroad. The report notes that while the allure of finding better jobs and experiences in other countries is a key factor in moving abroad, even in the top 10 nations, everyone’s experience is different. Potential emigrants should be sure they know that “the grass isn’t greener, just a different colour of green”. How exactly to Generate An Overview for a Research-Paper Where Is The Best Country To Be An Expat?